It’s also everything that’s wrong with the world. You can see a lack of respect everywhere. On the news, in children at the grocery store and daycare, in others who cut people off in traffic; a lack of respect for the fellow man is staggering. 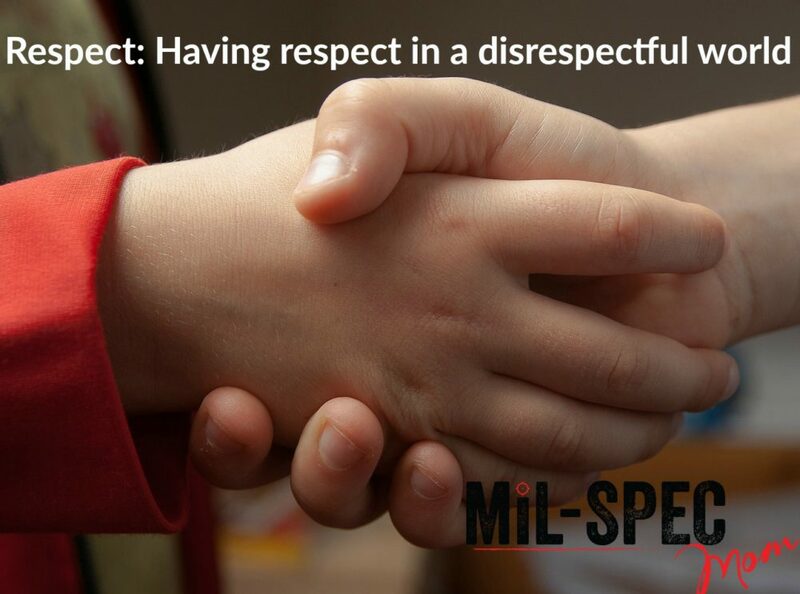 Respect is one of those things that you barely notice it when it’s there but when it’s missing it’s a huge gaping hole in society. You don’t always notice even a random person holds a door open for you, but when they let it shut in your face; you complain about it on social media for weeks. We don’t really notice if someone lets us merge easily on the highway. We have that entitled “that’s what they should be doing” attitude. But heaven help the person who cuts us off or makes it the slightest bit difficult. Again, we contact our social circles and exclaim, in an outrage, what this person did to us! You also see it when someone runs in front of you in line at the grocery store, which you were clearly eyeing. First, the problem is an inflated sense of self. We are never as important as we think we are to those around us. Trust me. When it boils down to it, they may like us and enjoy our company (or even be family) but others will almost always put themselves ahead of everyone else. That’s primal nature and that’s human/fleshly nature. Second, the problem is we have a downgraded sense of others. As I stated above; at the first opportunity, humans (that includes you) will put themselves first. That’s human nature. Self-preservation, even in the simplest form, is the driving force in all humans. Just as others will put themselves first, so will we. We are part of the problem. More accurately our sin nature is a part of the problem. Third, we don’t take Luke 6:31 seriously. We view it more as a convenience or something that we deserve. Read the book of Romans if you feel that you deserve an easy, convenient life. It’s also the “Golden Rule”. Treat others how you want to be treated. This doesn’t just apply to everyone else and how they treat us. As I said above, we are just as much a part of the problem as everyone else. I challenge you this week to think outside of yourself. You never know what others are going through. Case in point, yesterday my hubby and I went to a bookstore to look around. There was a 3-year old that was throwing an epic tantrum. Several people around us started murmuring about how awful the parents were. But you know what? That child could have been recently adopted, or a foster child from a bad home, he could have had Aspergers or another learning disability, the mom could be fighting a terminal illness and it’s all she has to get outside some days. You just never know. So before making judgments or dwelling on how inconvenient it is for YOU, think of someone else first and perhaps try to be helpful rather than damning.